I’m fortunate to be able to work from home in West Cork, Ireland. This is dependent on reliable, fast internet access. The copper telephone line to the village is too long to support this. Fortunately we have a local company who have built an extensive wireless network in the area: Digital Forge. I recommend you visit their site to see the video of the van driving up Mount Gabriel and an antenna being installed. This is where my internet access comes from! Installing, maintaining and upgrading a network like this is a big task. 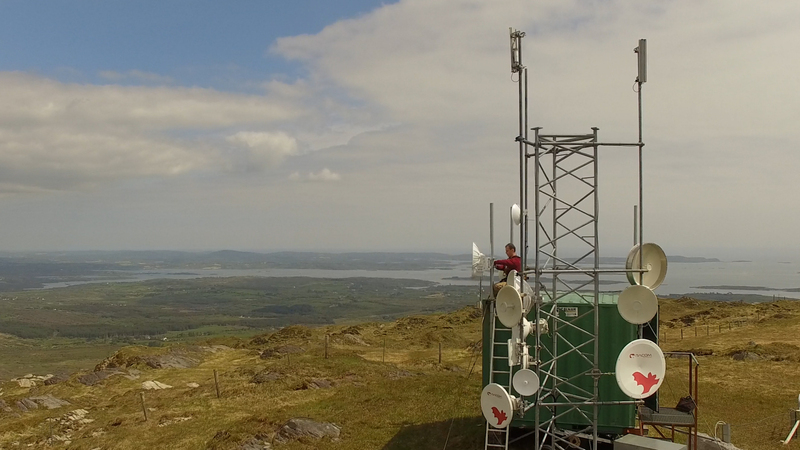 They have base stations all over West Cork to provide extensive coverage. West Cork has high winds and a lot of rain, so keeping everything working can’t be easy. On top of that they have to negotiate connection and upgrades to the fibre backhaul. Recently our connection got a boost with the installation of a new antenna (Ubiquiti 5AC 400) so we now have a solid 50mbps connection. This may not sound very fast compared to gigabit speeds in urban areas, but it’s plenty for a family in rural Ireland. I value the low latency (10ms ping times to most services) and stability. It’s reasonably priced and we get a great VOIP phone service with a regular land line number included. This is much better value than paying for a fixed line with a traditional phone company. When we pay our monthly bill it’s good to know that the money is going to a local company with local employees. Even better, there is the reassurance that if there’s a problem you can speak to a person who knows about our installation and can be on site very quickly to help. A couple of months ago I had problems with my local network and I suspected a faulty PoE injector. I phoned Digital Forge to see if they could help, and even though it was nearly the weekend, the owner dropped a replacement for me at a local shop. After swapping out the part I was up an running again. Ireland has a controversial national broadband plan. It’s my understanding that small local ISPs have not been able to successfully bid since the framework favoured one or two large stakeholders. This is a shame since local ISPs have done a great job developing networks to support rural internet access in Ireland. I have no idea if the national plan means we’ll ever get FTTH (fibre-to-the-home). For now I’m very happy to support Digital Forge and I think they deserve state assistance more then Eir does!